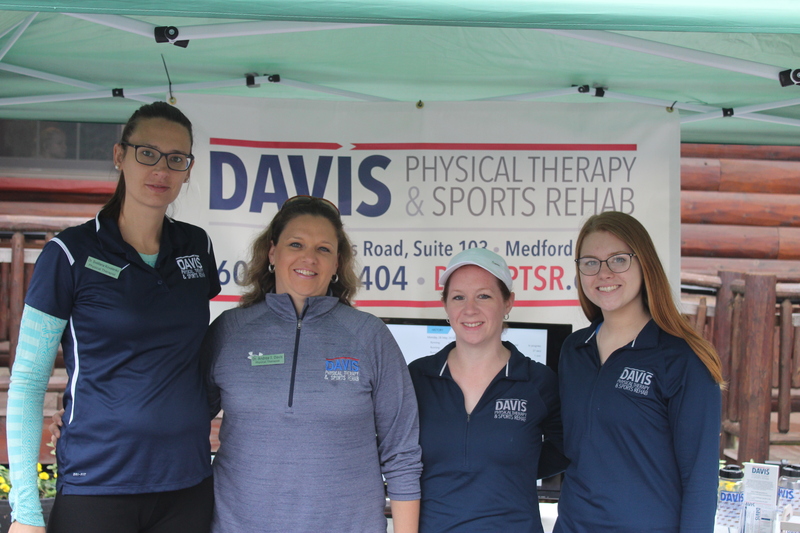 Dr. Andrea Davis of Davis Physical Therapy & Sports Rehab was at the Medford Lakes Colony Memorial Day 5K. She brought her team and some tech that is very new to our industry and our country. The dorsaVi ViPerform running sensors, analysis, and computer technology were developed in Australia. It received clinical admission to the U. S. just last year. 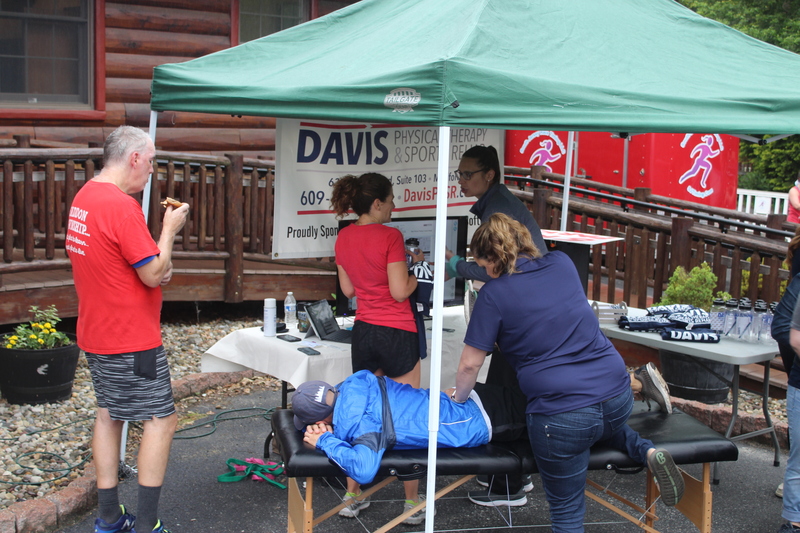 Dr. Davis was one of the first to adopt the new platform and bring it to local pro sports teams and high schools as a way to help prevent running injury and promote better running recovery post-op. One of my friends, Brigid, agreed to wear the sensors and data recorder for the race. At the end, she came back to the Davis tent for some surprising results. dorsaVi shows on their website that they use two types of encapsulated sensors: one for motion and one for muscle activity. The sensors include accelerometers, magnetometers, and gyroscopes that wirelessly transmit data at 200 frames per second to a wearable Recording and Feedback Device (RFD). Data points for running include leg symmetry, ground force reaction, acceleration, ground contact time, and some basic things like cadence and speed. Dr. Davis explained the system to Brigid. Then she measured the placement location of each sensor. Each one was located on a calf about half-way up, just slightly to the interior. A non-irritant/allergenic spray adhesive kept the sensors in place. The RFD could be carried in a pocket, pouch, or armband. 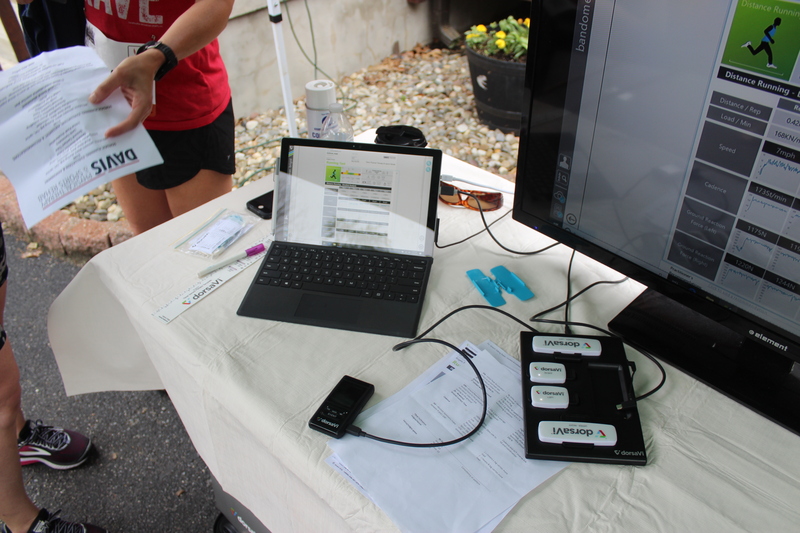 After getting hooked up, Dr. Davis provided a brief tutorial of what to expect from the biofeedback after the race. Then Brigid took off and had the best 5K of her life. The bad news was that she kicked the sensors off twice. The sensors did not fall off. Brigid kicked them off because, as she found out in the data analysis, she has an imbalance. That leg imbalance caused her to kick her calves. This is actually a very common situation for runners and quite often they are not aware of it. There are some very simple single leg exercises that can help alleviate the problem. That’s where Dr. Davis and her team of other runners provide the analysis and solutions to athletes. Brigid was delighted. Now she has a plan to not only prevent injury due to the imbalance but also to gain strength and speed as she progresses through the PT to correct the issue. Perhaps that will lead to another PR at her next race. The OCRMudmaster’s evaluation of this product is a 4 for 5. Let’s hear what others have to say. To find a clinic near you where you can try this new tech, look here.